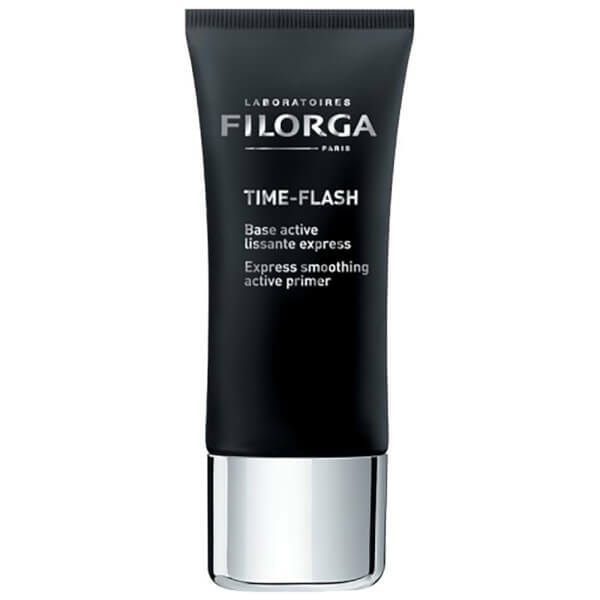 Discover anti-ageing effects in an easy-to-use formula with Filorga Time Flash, an innovative makeup primer that resurfaces the complexion. Powered by a blend of four active ingredients including a collagen booster and Hyaluronic Acid, the formula helps to plump and firm the skin to minimise the appearance of fine lines and wrinkles. 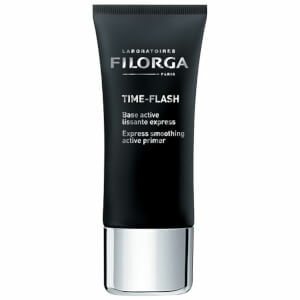 Lift and blur technology tightens the skin surface whilst refining pores and smoothing the complexion, leading to a healthier and more youthful-looking visage. Aqua (Water), Cyclopentasiloxane, Glycerin, Caprylyl Methicone, Butylene Glycol, Vinyl Dimethicone/Methicone Silsesquioxane Crosspolymer, Alcohol Denat., Dimethicone Crosspolymer, C30-45 Alkyl Cetearyl Dimethicone Crosspolymer, Silica, Cyclohexasiloxane, Pentylene Glycol, Pentaerythrityl Tetraethylhexanoate, Parfum (Fragrance), Caprylic/Capric Triglyceride, Ci 77891 (Titanium Dioxide), Polyacrylate Crosspolymer-6, Hydroxyethyl Acrylate/Sodium Acryloyldimethyl Taurate Copolymer, Avena Sativa (Oat) Kernel Extract, Chlorphenesin, Triethoxycarylylsilane, Alpinia Galanga Extract, Hydrogenated Vegetable Oil, O-Cymen-5-Ol, Sucrose Palmitate, Crithmum Maritimum Extract, Carbomer, Sodium Lactate, Polysorbate 60, Sorbitan Isostearate, Sodium Benzoate, Polysorbate 20, Xanthan Gum, Glyceryl Linoleate, T-Butyl Alcohol, Prunus Amygdalus Dulcis (Sweet Almond) Oil, Sodium Chloride, Ci 77491 (Iron Oxides), Glucose, Acetyl Hexapeptide-8, Phenoxyethanol, Sodium Hyaluronate, Citric Acid, Potassium Chloride, Palmitoyl Tripeptide-1, Potassium Sorbate, Calcium Chloride, Dimethicone, Palmitoyl Tetrapeptide-7, Magnesium Sulfate, Glutamine, Sodium Phosphate, Ascorbic Acid, Sodium Acetate, Tocopherol, Lysine Hcl, Arginine, Alanine, Histidine, Valine, Leucine, Disodium Stearoyl Glutamate, Threonine, Isoleucine, Tryptophan, Phenylalanine, Tyrosine, Glycine, Polysorbate 80, Serine, Deoxyadenosine, Cystine, Cyanocobalamin, Deoxycytidine, Deoxyguanosine, Deoxythymidine, Glutathione, Asparagine, Aspartic Acid, Ornithine, Glutamic Acid, Nicotinamide Adenine Dinucleotide, Proline, Aminobutyric Acid, Methionine, Taurine, Hydroxyproline, Glucosamine, Aluminum Hydroxide, Coenzyme A, Glucuronolactone, Sodium Glucuronate, Thiamine Diphosphate, Sodium Uridine Triphosphate, Disodium Flavine Adenine Dinucleotide, Retinyl Acetate, Inositol, Methyl Deoxycytidine, Niacin, Niacinamide, Pyridoxal 5-Phosphate, Pyridoxine Hcl, Biotin, Calcium Pantothenate, Folic Acid, Riboflavin, Tocopheryl Phosphate.